Home > News > Samsung Galaxy S6 Edge bends just like iPhone 6 Plus: Bendgate 2.0? Samsung Galaxy S6 and Galaxy S6 Edge were revealed at the MWC 2015. There are a lot of expectations from the two flagship phones and various US carriers have started pre-order sale of the devices. In the meantime, let’s remind you about iPhone 6 Plus Bend Gate massacre. The highly resplendent piece of gadgets was found to bend while being kept inside users pockets. Even though the numbers were almost negligible, yet Apple received tremendous vituperation from other technology giant. 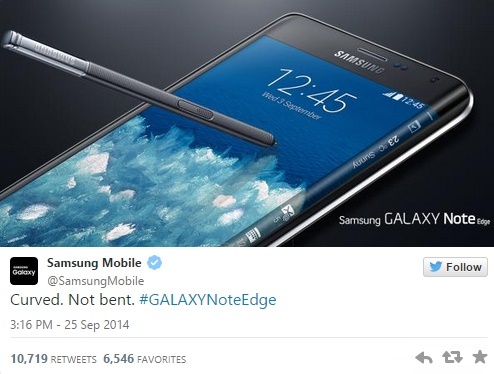 Now the much coveted Galaxy Edge is the new member of the Bendgate community. Speculations say that Bendgate v 2.0 has arrived holding hands with the upcoming latest flagship device from Samsung. The toleration test was carried out by SquareTrade, which unveiled that Galaxy S6 bends just as easily as an iPhone 6 Plus. SquareTrade carried out the test on three flagship phones- the iPhone 6 Plus, HTC One M9 and Samsung Galaxy S6 Edge. The iPhone 6 Plus was put under 110 lbs of pressure at which the pin bent. When the same pressure was applied on S6 Edge the phone not only bent, but also the stylish Edge and the screen nearby the Edge cracked. The HTC One M9 could withstand about 120 lbs of pressure before it became non-functional. This was because of the location of the power button just at the bending point.